Last week I went to a talk by Penny Kittle sponsored by our school district on how to help your kids with writing at home. During the hour and a half presentation she spent more than half the time talking about the importance of reading. Scholastic published a report on reading in 2014 that shows a significant drop-off in kids reading for fun after the age of eight. The numbers drop in each of the age groups bottoming out in high school where sometimes kids aren’t reading any books for fun throughout the year. Many of the kids aren’t even reading the assigned books, opting for summaries instead. This is leading to a decrease in reading stamina that is needed for college. While she didn’t address it directly, it is likely that these same kids are suffering when it comes to writing. The study also shows that kids with access to large numbers of books read more. As a parent I have rarely said no to a request for a book (unless it is inappropriate). We are very lucky that our school library is good as well as the public library system in our area. We have access to almost any book the boys could want. When kids can pick their own books they are much more likely to read them. Another point the study made was the importance of reading aloud with your kids and modeling reading behaviors all the way through high school. Most every night in our house we have reading time before bed. 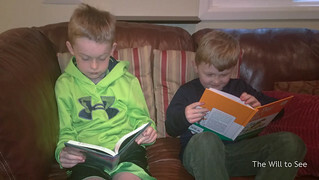 I read with Will and Jim reads with Jack, because they are at different levels. I hope that in the future we will all be able to read together. I remember as a kid loving to read, even though I am a fairly slow reader. I would read my school books during the day but before bed we would read for fun. My mom, sister and I read the entire Little House on the Prairie series together, taking turns reading to each other. We are working hard to instill these and other habits in the hopes that our kids will benefit from reading in the long term. What things are you doing to instill a love of reading in your children?